One is that because the MIDI messages go to SdrDx even when it is not the active application, you can use the radio without having to leave the application you're currently working in — email, spreadsheet, photo processing, etc. Another is that the control surfaces allow a style of control not available through the GUI, for instance, you can tune at six different speeds with six different tuning knobs, or adjust the demodulator bandwidth with knobs. Some control surfaces can memorize "scenes", which are essentially a memory of every setting on the board, so you can save and load entire radio setups in one action, right from the board. Finally, as all knobs and buttons may be re-configured, you can set the board up the way it makes sense to you. The surprisingly inexpensive BCR2000 Behringer B-Control Rotary Control Surface brings 32 real-world knobs, as well as 24 more virtual knobs, and 20 physical buttons to SdrDx. SdrDx defaults to a configuration that immediately supports this control surface out of the box, but you can re-map any knob or button to any SdrDx slider, knob or button at any time. Also, if you have some other kind of control surface, if it can provide standard control change MIDI messages on channel zero, you can configure it to work as well. If your control surface provides for parameter feedback, it should be set up to receive control change messages for MIDI channel one. SdrDx receives control changes no matter what channel they are sent on. You should have your control surface plugged into your computer and powered up before you start SdrDx. A MIDI control surface can send a lot of control messages, and if you really twist the knobs vigorously, you can create a backlog of unprocessed messages, which SdrDx will busily process before it lets you do anything else. The slower your computer is, the more of an issue this could be. So be gentle with the knob-twisting and slider-pushing. When SdrDx is running, it sends MIDI information any time you change a control in the main window, or adjust one via the TCP interface. Likewise, it's listening all the time, and if you have any kind of MIDI device active, SdrDx is likely to interpret any message from that device as some kind of instruction to modify controls, and much weirdness will result. Basic rule: You can run SdrDx, with or without a control surface or your other (e.g., musical) MIDI activities. Not both at the same time. At the BCR2000, plug it into the wall, plug a USB cable into the computer and the BCR2000, then turn on the BCR2000. Press and hold EDIT, press (tap) STORE to enter the main setup menu, then release EDIT. Turn the top left controller until the main display reads U-1. Now press EXIT. The BCR2000 is now correctly configured for use with SdrDx. Caution: Surface Controller Configuration If you have a surface controller other than the BCR2000, ensure that one of your continuous controllers is programmed to send (and respond to, if it supports parameter display) controller 81. Likewise, make sure an on/off controller is set to controller 67. These are initially configured by SdrDx for VOL and MUT, respectively; knowing which controllers are expected to affect what items on the SdrDx interface (and the other way around for parameter display) will make initial setup much easier. Basically, SdrDx sends on channel 1 and receives on all channels. A good start is to set your control surface up to transmit and, if it can read back the current setting, to receive on channel 1. That should complete your actual MIDI setup. Other than that, make sure it knows how it is connected (USB port, serial MIDI port, etc.) and that any drivers it needs are installed (especially under Windows of any stripe) and it should "just work." However, under Windows 7 Starter, the input port needed to be set to 1 (one.) This will clearly differ from machine to machine. It's difficult to know what this configuration will be ahead of time, so what you need to do is open the dialog ( →Right-click MDI), set the values, quit SdrDx, restart it, see if that works. If not, try another configuration. If you want to use MIDI, you need to open this dialog, and check the two checkboxes: Interactive MIDI Define and Use MIDI Interface - If you change the Use MIDI Interface setting, you should restart SdrDx after exiting the MIDI setup dialog. The dialog tells you how many ports there are. For instance, if it says there are 2 (two), then you can set 0 or 1 for either port. Setting values outside the limits of 0 and 1 results in no change to the port number. Remember, you need to restart SdrDx after making a change or it won't know about the new port numbers. Just start at zero and work up. When sending is working, if your control surface supports parameter display, you'll see it change when SdrDx controls are adjusted. If it doesn't support parameter display, then you only need to concern yourself with the SdrDx input port number. You'll know you've got that right when adjustment of controls on your control surface result in changes on the SdrDx GUI. Getting SdrDx to learn a slider or dial is a two-step process. 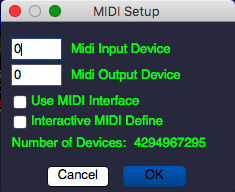 Before you start, →Right-click MDI and place a checkmark in the Interactive MIDI Define box. This enables the define process. When you're done defining controls, you should re-open this dialog and uncheck this control. Begin by pointing at the slider you want to use with the control surface, and click the right mouse button. MDI should begin to flash white. Now, simply adjust the control on the control surface, and the control will map immediately -- you will see the control in SdrDx adjust along with the adjustment made on the control surface. To cancel, right-click any slider again prior to moving anything on the control surface, or press ESC. Getting SdrDx to learn a MIDI control association is a three step process. Before you start, →Right-click MDI and place a checkmark in the Interactive MIDI Define box. This enables the define process. When you're done defining controls, you should re-open this dialog and uncheck this control. At this point, to define a control, begin by pressing the ESC key; MDI will flash white. Now left-click the SdrDx interface button you want to configure. MDI will now flash blue. Finally, press the button on the control surface. To cancel, press ESC again any time prior to pressing a button on the control surface. This is a three step process. First, press the ESC key; MDI will flash white. Now press a letter key from the table below. MDI will now flash blue. Finally, operate the control on the control surface. To cancel, press ESC again any time prior to pressing a keyboard key. Changes you make with learn mode are saved and will remain in effect the next time you start SdrDx. Caution: It should be fairly obvious that sliders and dials naturally map to continuous controllers (knobs, dials, foot controllers, theremins, etc.) and buttons and so on map to buttons, on-off foot switches and the like. However... you can map them otherwise, and they will then act somewhat strangely until you map them back to the type of controller that naturally matches the control itself. No harm done, generally, but it seemed worth pointing out. Warning: The only way to globally reset all changes made with learn mode is to delete the SdrDx plist file in your /Users/you/LibraryPreferences folder. Otherwise, changes are made one control at a time. When SdrDx starts, it has a default MIDI configuration that assumes the Behringer BCR2000 control surface. Initial mapping is as follows, numbering is left to right. This row of knobs is automatically mapped (by SdrDx) to 8 functions that are not otherwise available as knobs or sliders, to re-define them use the keystroke method (#3) shown above. Note: The LED indicators on the top row, rightmost six knobs do not typically reflect any setting within SdrDx in the default configuration. This is because they are defined as infinite controllers. The first two knobs in this row only send settings to SdrDx; they do not change values when you change demodulator modes, but if you adjust them, they will immediately set the demodulator envelope accordingly.